This spring I’m probably going to be spending most of my time outside going on walks with all three of my babies. Little man will be here so soon, I can’t believe how fast the time went by. We cannot wait to meet him. Monroe goes around the house holding her baby dolls calling them baby brother. She’s ready to take care of him every day! My favorite way to feel better after giving birth is being able to get outside and get some sun on my face. I feel like being cooped up in my house all day really takes a toll. I’m sharing one of my secrets to putting together the perfect outfit for spring. Now, I like to keep my outfits pretty simple so that I can dress them up with accessories. Accessorizing your spring outfit is what I’m here to help out with. If you’ve noticed in my photos, I love to add small dainty necklaces to my outfits and pair them with earrings of choice. The secret it, accessorizing! Yup, you can transform the most basic outfit to make it so fierce. Earrings are for sure my favorite jewelry item. I have always loved them ever since I was a little girl. 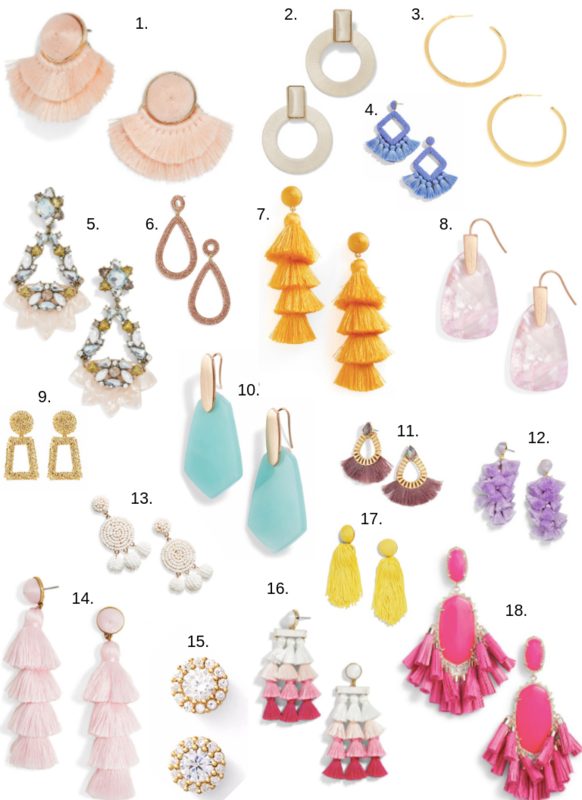 I’ve put together some of my the most gorgeous earrings that will pair fabulously with any outfit for spring. Earrings are like the icing to the cake. I’ve linked several different styles of earrings that I absolutely love. There are tons of different styles like tassel, hoops, studs, dangling and more! Some of my favorite ones are the large jeweled shiny earrings. Haha, I sound like a little girl all over again. I love all the gorgeous colors for spring. Some of my favorite to accessorize my outfit for spring with are yellow, purple, pink and blue! They give your outfit the perfect pop of color without feeling like you look like a fruit salad!